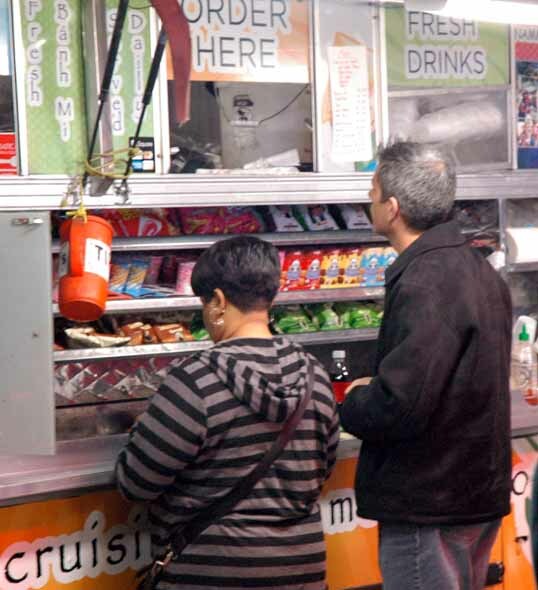 As I was puttering around the house Saturday, trying to shake off the ache of a sleepless night, I thought about getting some cereal or something in my gullet – but I realized there would be food trucks at the Ciclovia de Dallas and that I would want to eat there. That made for some hungry driving around, but I was rewarded as I cycled across the closed-off Houston Street Viaduct by the appearance of a gourmet food truck that I had never tried before. 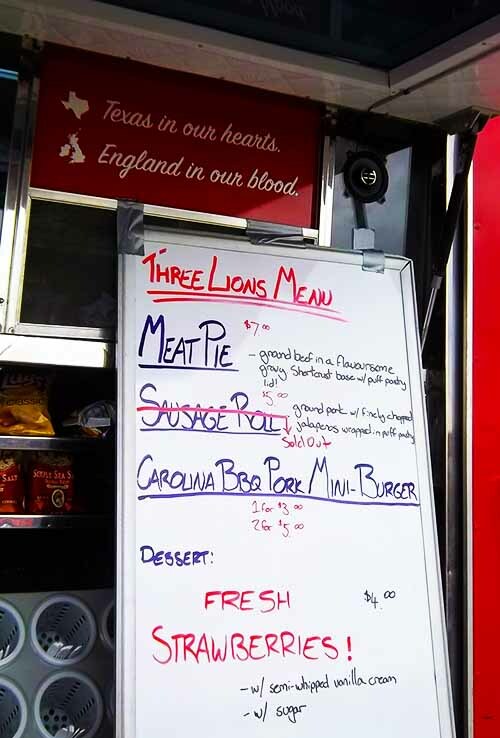 It was the Three Lions truck and this one boasted English Food. 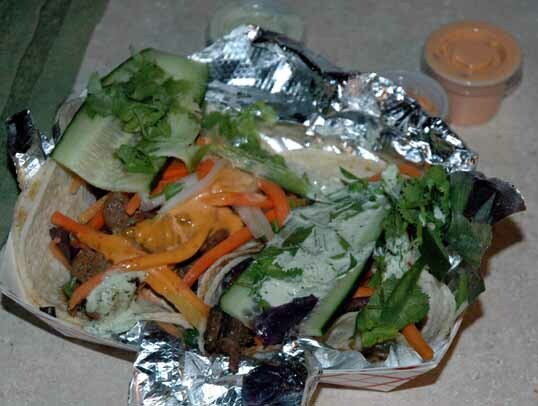 A while back I tried the excellent Three Men and a Taco truck and it was good. 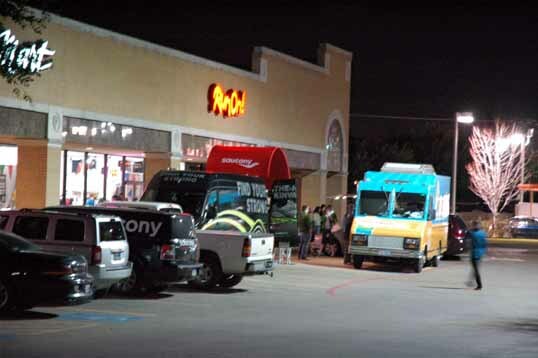 The problem is that the folks behind this truck were British ex-pats and driving another Taco truck around North Texas didn’t fit in with their souls. 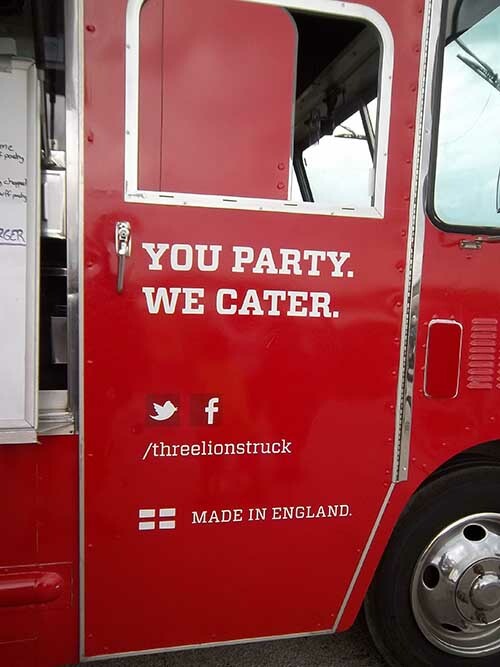 So the gaudy Taco wrap came off and the truck became Three Lions. Most of the Ciclovia festivities were over before I arrived. When I rode my bike up to the truck they were working on the menu sign, crossing off the Sausage Roll. Looking at what was left, I decided on the Meat Pie (The Carolina BBQ Pork Mini Burger looked good, but didn’t sound very English to me). While I was waiting for my food a guy came up to grab a napkin and told me, “Oh man, those sausage rolls are great… Oh crap! They are out of them!” He looked at me like a poor relative as they handed me my meat pie. I moved to the condiment section and chose the bottle of Sriracha (anything good is better with Sriracha on it). A Hispanic family was standing there eating the last of the sausage rolls and the man pointed to the Sriracha and in broken English said, “That stuff is good… spicy!” I agreed and gave it another squirt. 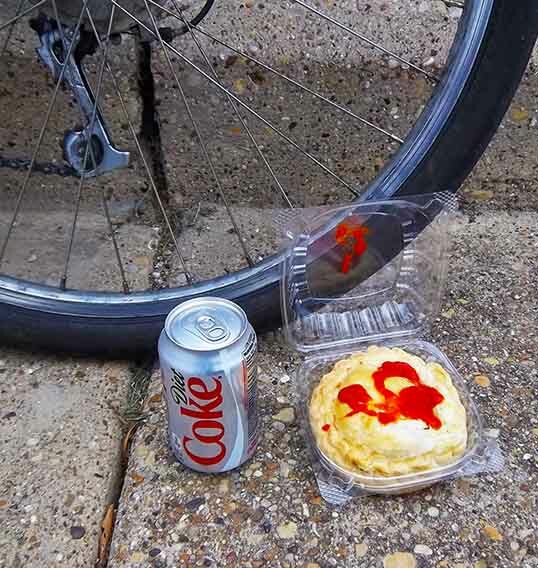 I carried my pie back to where my bike leaned up against the concrete bridge rail. I sat there eating, listening to the live music, and watching the bikes of the Ciclovia de Dallas roll by. It was good, though I was so hungry I can’t really give a fair review. Some day, though, I’m going to try that sausage roll. Texas in our hearts, England in our blood. 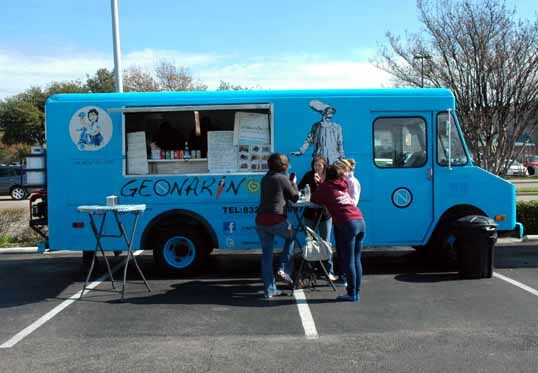 I surfed through Twitter and Facebook, looking for stuff to do today, and found a Food Truck I had never tried before, Gennarino’s set up on the Siegel’s Parking lot down on Upper Greenville, just north of Lover’s. 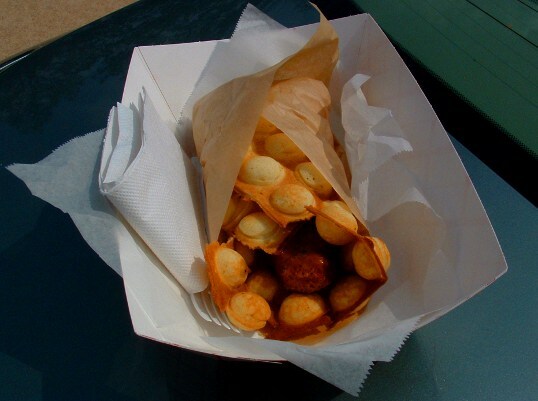 Gennarino’s is a Friggitoria, which is Italian for a place that sells fried foods. 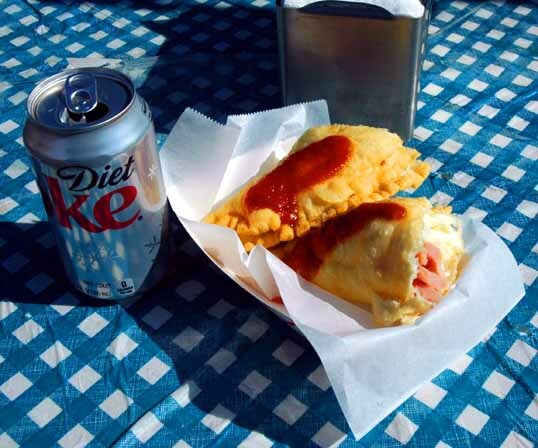 In this case, it’s a truck that mostly sells things made out of fried pizza dough. 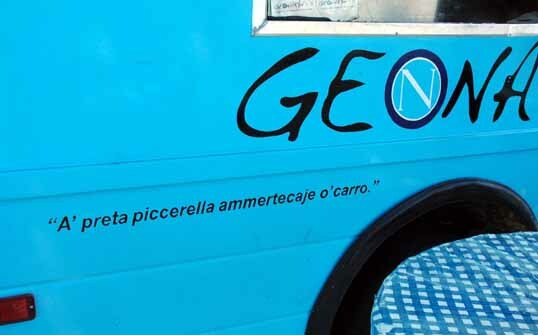 Their menu specializes in Neapolitan street food. One woman (I think it was Raffealel’s wife – one of the owners) pointed out the specials, so I ordered a Calzone, something I was familiar with. 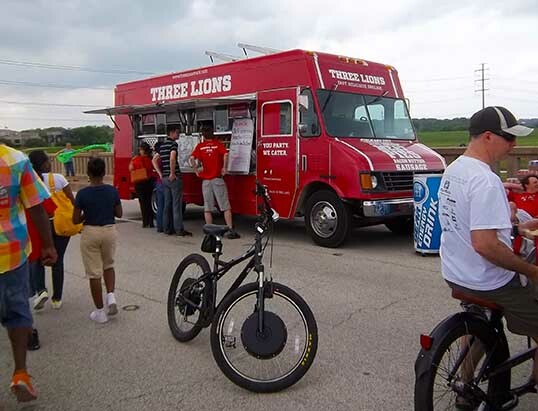 I was able to chat with Raffealel for a bit about the food truck business and how they started (three brothers and Raffealel’s wife) and where he liked to set up. This truck runs out of Irving, which is why I hadn’t seen them before. 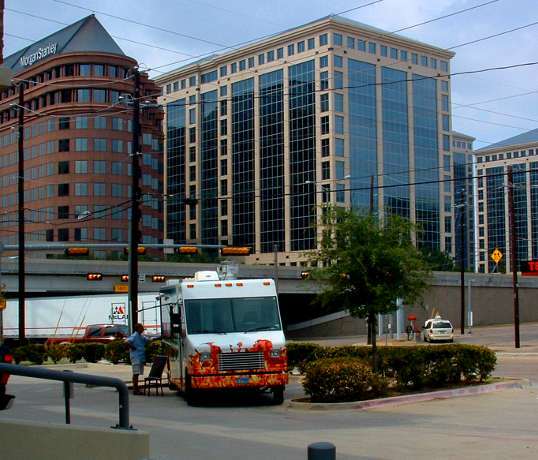 He said he was doing mostly lunch business outside of office buildings in Los Colinas. He was very friendly and I really enjoyed talking to him, so when you visit his truck, be sure and say hello. 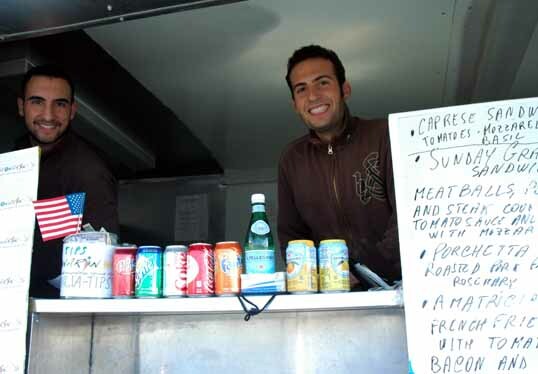 They had a couple of tall stand-up tables set up outside the truck which was nice – it’s always frustrating when you get your food and don’t have a place to eat it. My calzone was great. The fried dough was very crisp and light and not too greasy at all. It was a delicious treat, not like eating a football, which a lot of calzone’s feel like. I wish Gennarino’s ran in Dallas more often. I’d like a chance to work my way through their extensive selection – that fried spaghetti and meatballs looks good, so does the pizza, and I’d like to bite into that Zeppolone (I always like something inside something else). Good food makes for happy customers. Raffealel and his brother. They were great. I have no idea what this means, but it looks cool. Raffealel out helping a customer with the menu. I now have a new obsession. 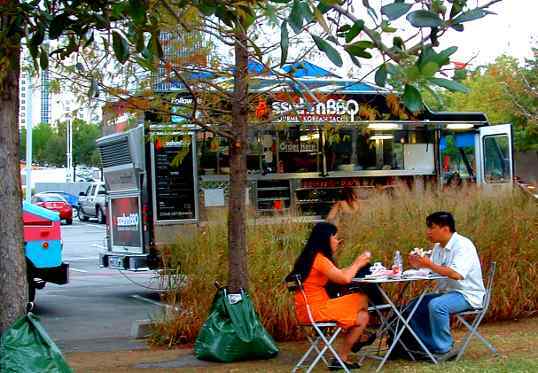 The recent trend of gourmet food trucks is… well, I like it. I like the idea of quality eats in a portable location. 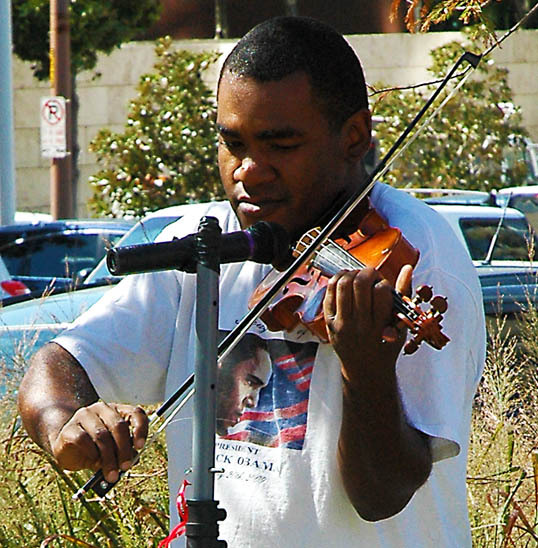 I like the culture that is growing around the things. 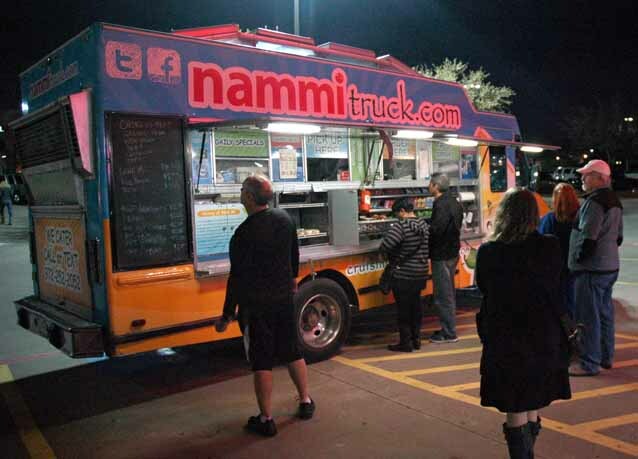 I like the idea that the Internet and smart phones are what are making the gourmet food truck movement possible – you can watch the twitter stream of your favorite trucks and find out when they are near you. It’s pretty damn cool, if you ask me. This is truly the best of all possible worlds. Last Friday, I enjoyed some Korean Bar-B-Q fusion down in the Arts District. 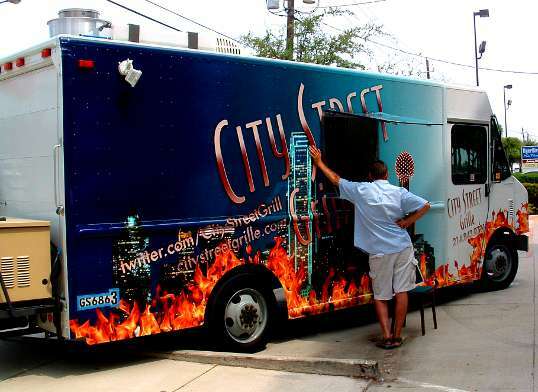 On Saturday, around lunch time, I felt a mite peckish, so I went on-line and found a food truck, The City Street Grill, would be near the Galleria, in the parking lot of a jewelry store, until 2:30. That’s a good location for me – I could go grab some lunch, then head up the tollway to Frisco and get some writing in at the college library up there. I checked the truck’s menu… Chicken and Waffles! That’s the ticket. The City Street Grille at a jewelry store near the Galleria, right by the Tollway. The place was wicked hard to find. I drove right by it once. I have an innate fear of jewelry stores (a good survival instinct in these modern times) but I gathered up my courage and marched up to the truck. I can see the future in this. 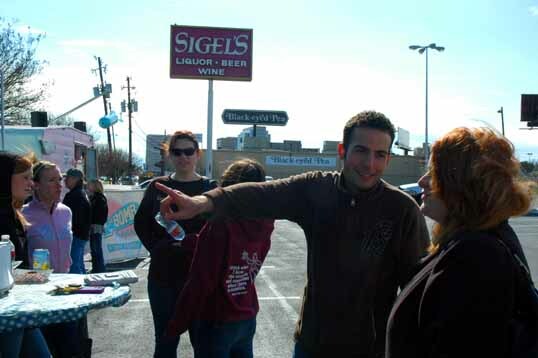 It’s actually a friendly situation – talking to the folks in the truck, other customers. A customer waiting for his food. The food was great. Fresh, aromatic waffle, succulent fried chicken, made right in front of me, easy to eat. On Friday I decided to take the DART train downtown after work. There were all sorts of festivities planned for the Arts District and beyond and I couldn’t think of anything better to waste my time with. I arrived pretty early and had time to walk around watching roadies unload and put together stages, rows of seats, and banks of elaborate lighting effects. There’s nothing better on a late Friday afternoon than hanging around, being useless, and watching other people work. Looking at all that effort made me hungry after a while so I set out in quest of some gourmet food trucks. 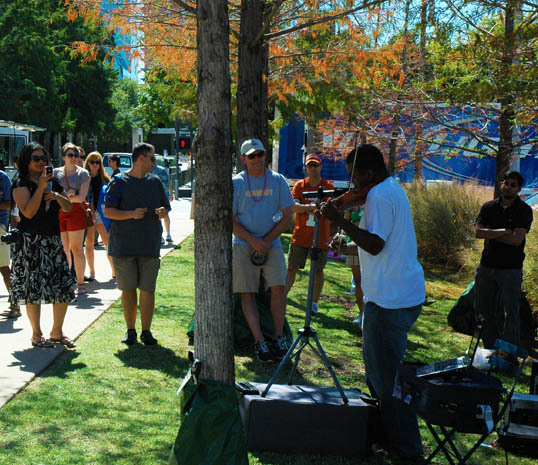 One of the festivities going on was to construct a number of mini-parks in parking spaces all over downtown. 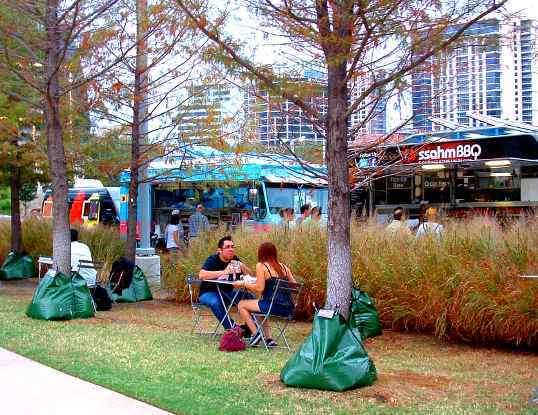 Between the Nasher Sculpture Center and the Symphony Hall they filled in some spaces with portable turf and set up some dainty chairs and tables – better to chow down on the fare from four trucks set up in the parking lot. 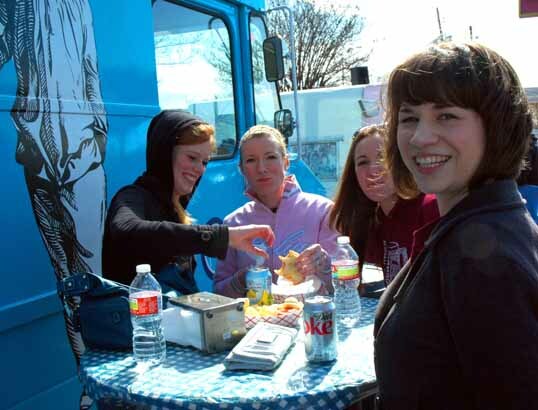 Food Trucks and tables in the Dallas Arts District. 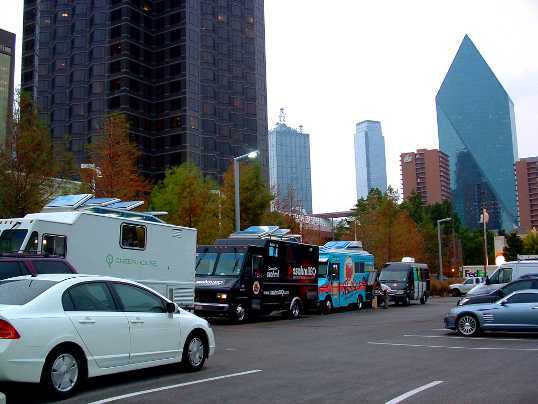 Four food trucks lined up in a downtown Dallas parking lot. They all looked great, but I was standing closest to Ssahm BBQ so that’s the way I went. 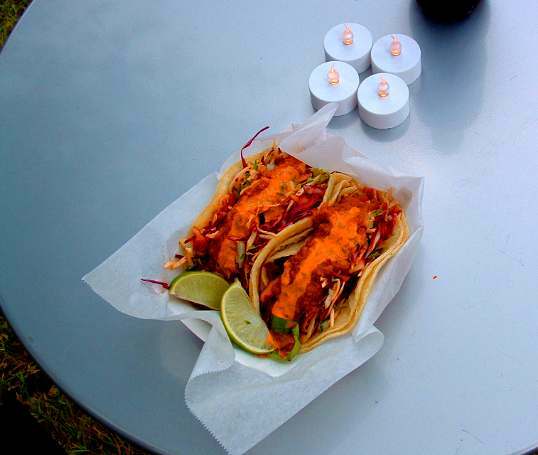 I took a quick glance at their menu and ordered a couple of tacos – one chicken, one tofu. It was great. Really good, spicy food. I sat at the little table in the parking space and ate my tacos. ssahmBBQ Tacos. Really good. I liked the little battery-powered candles on each table. Pretty upscale for a parking lot. Kimchee Fries! Why didn’t I think of that. I looked at the menu. Oh get the hell out! 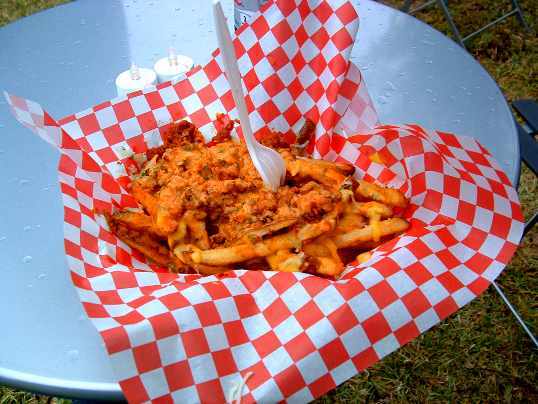 I sat for a minute enjoying the evening, then trooped back to the food truck to place my order of Kimchee fries. Was it good. You betcha! Now I need to follow that truck around. Or if it’s on the other side of town… make my own. 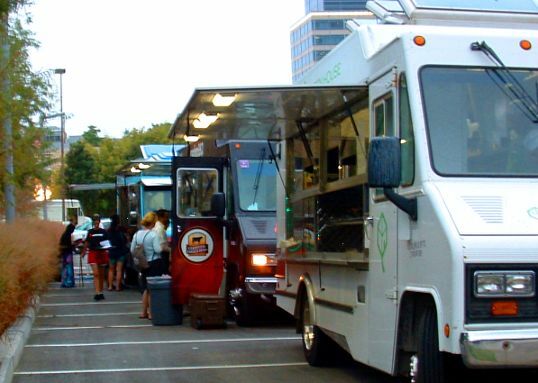 Food Trucks in the Dallas Arts District.